Welcome to WeMod, hope you enjoy your stay. Welcome to WeMod! You’ll find you aren’t alone, my opinion of humanity as a whole is less than stellar, I choose my friends wisely. In that regard, I’ve met quite a few good people here I enjoy messaging with. Anxiety is nothing to be ashamed of, my father has it, I have it (rather significantly in fact). We both tend to be rather reclusive, and that certainly plays a part. Such illnesses impact us, but don’t define us. We can only treasure the “good days” and endure the “bad days”. Though there is, and will likely always be a stigma surrounding such things, I’ve learned to chalk it up to ignorance and leave it at that. Those who are judgmental have not themselves ever experienced such a condition, so they are little more than clueless fools. You are always welcome to message me regarding any issues you might have with such challenges, odds are “I’ve been there”. Hello, and welcome from a fellow nutty-potato. Just saw this post while lurking and decided to post for the first time on the forums. I myself have ADHD + HSP + Depression + Anxiety and a topping of Panic disorder. Seems we are kindred spirits @STN, I’ve got more health problems than I can shake a stick at (I’ve been told I’m a “walking pharmacy”). I know what you mean about not being able to live life the way you want to, it has been a struggle for me for many years some days. You have to live your life “around it” and that is frustrating. The real “winner” for me was the time I went to see the doctor at 40 and a new nurse was looking at my chart. She said, “Usually people in their 60’s have such conditions, this is unusual”. Of course, she quickly realized she probably shouldn’t have said that when I responded, “Lovely, I have the health of a 60 year-old”. She apologized, but it is one of those things one doesn’t like to be reminded of. Just frustrating more than anything. My dad is 87, and teases me he’s better off than me sometimes. All in good fun though as I hassle him about not using a walker when he stumbles all over the place, we both have our pride. I always tell him, “Only the good die young dad, I’ll outlive all my peers. My end would make too many of my adversaries happy, I can’t allow that”! I try to take it in stride, can’t change the cards we are dealt, but certainly don’t have to like it! @ptondo I might have you beat. My first gaming system was Pong, followed by the Atari 2600…yeah, I’m pretty old compared to most here. There she be still have it. Almost got me 52 !! Holy cow! Wouldn’t have believed it. I havent seen a pong game in decades. 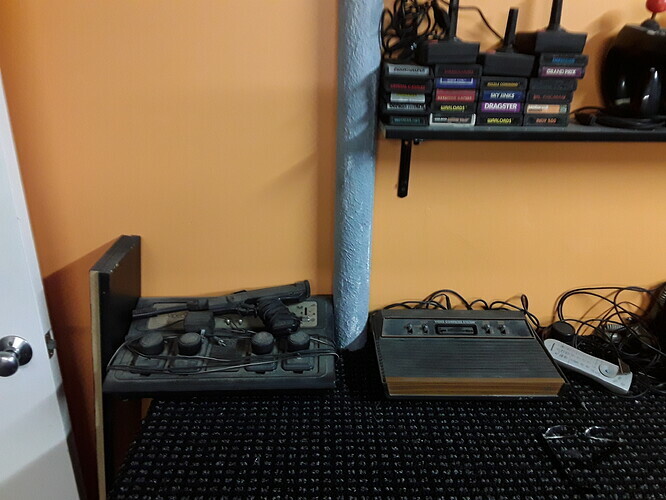 And 3 joysticks for the 2600! I remember taking one apart and modifying another so that I had one joystick with two buttons so I didn’t have to use two joysticks. Nice collection. Don’t suppose you have a Intellevision and Colecovision (?spelling?) in your museum? I had both of those too. I wonder if anyone would read a game “museum” and nostalgia thread here. Ah, the memories. You just taught me something about myself!!! Thank you very much for taking the time to actually include a Wikipedia link to HSP! That simple act made someone else’s life a little better today. I am definitely on the high end of the SPS scale, I would not classify myself as HSP, but it still explains so much about myself. Wish I knew this about myself YEARS ago. Maybe, just MAYBE I can return the favor with another obscure trait.